So one afternoon my wife comes to me and tells me when she turns on the hot water faucet to prepare a tub there is no water. So I go check and sure enough there is no pressure on the hot side of the faucet. I remember checking our heater, which is inside the house, previously which was making a funny noise and noticed a submarine looking thing plumbed in sitting at the bottom of a pan. As I DIY guy on his 3rd house, I have to say I had no idea what this was previously but at this point figured it was some sort of valve. After checking with the big box stores and a few plumbers could not find anyone that knew what it was. After another attempt at google searching pics I find the exceptional WAGS valve. After seeing this thing work perfectly I could not buy one fast enough straight from the WAGS website. We had relatively new floors in the house and this valve prevented a flood and potential redo of the floors which would have been very costly and a huge hassle. The tank had leaked into the pan activating the valve which shut off the water and contained the entire mess in the pan. Not a drop of water on the floor. This valve is a must-have for a water heater inside a house or anywhere else in an area where water damage is a concern. I was having lunch with a friend last week and she told me that the hot water in their house went out and the water heater started leaking. Her husband told her the only thing that saved them from a man cave flood was a special valve that closed off the water line. Turns out it was called a “WAGS”, an installation safety add-on that he ok’d with the plumbers recommendation - sometime around 7 or 8 years ago. My husbands birthday was fast approaching, and as a usual I didn’t know what to get my favorite handyman - tools & stuff… I haven’t got a clue! So I did a quick search for local plumbers trying to locate a WAGS to give my DIY birthday boy and no luck… valve and installation only. After three calls I found a plumber who told me where to locate the manufacturer and within a 10 minutes I was on the phone with Steve Fielding from Aquaguard, they make the valve right up in Rhode Island. He talked me through the two model choices and decided the water-only shutoff unit was the way to go. With Amex in hand it was on the way that same afternoon - WOW! My husband received the 2nd day UPS delivery of the WAGS Valve, and was like a woman getting a pair of designer shoes! He took it out of the box, took pics of it, and sent it to his buddies – might be his best b-day gift this year!!! I have sent him your new website (www.wagsvalve.com) and asked him to forward to his friends! The WAGS valve saved my finished basement and I will never own a home without one installed on my water heater. On the Saturday before Mother's Day 2009; my wife discovered water on the floor of our laundry room that adjoins the finished family room. "Earlier in the week, the pressure relief valve on my water heater had blown off some water and was trickling. I know that every once in a while, one of those valves will pop and get stuck so that it can't reset itself. I "fixed" the problem by giving the valve "a light tap with a hammer," but that Saturday, the pressure relief valve failed again and began dumping water through the overflow pipe. The water first ran into a bucket that I have always kept there just in case the pressure relief valve blew off water, it wouldn't go on the floor. The bucket was wedged into a tight space and didn't sit level. The water soon filled the bucket, which fortunately for me was tilted toward the drip pan under the heater. As water collected in the pan, the WAGS valve did what it was designed to do– shut off the water and gas supply and stop the leak. Just months previously I had a new, 50-gal, gas-fired water heater installed to increase my home's hot water capacity. 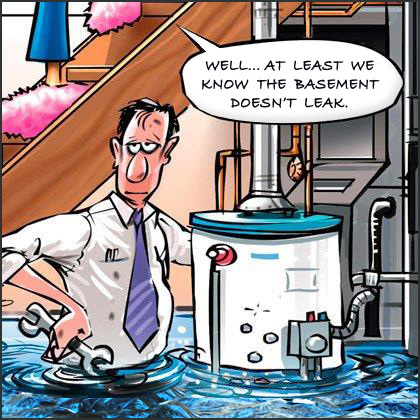 A friend told me how frequently water heaters fail and about the flooding and damage they can cause. As a gift my friend gave me a WAGS valve for the new heater. I hired a plumber to install the WAGS valve. The plumber wasn't familiar with WAGS and wasn't convinced of its value. He objected to the fact that WAGS can't be reset and must be replaced after it's been triggered. "In hindsight, I probably thought a little bit that way too”, but now looking back on it and having had the problem, I think for the peace of mind I have now it is well worth the money. Considering the financial and emotional disaster a flooded basement can cause, I think every water heater install should have a WAGS valve! UPDATE - June 2018: Well, the Rheem/Richmond 8 year model finally gave in.... after 18-1/2 years!!! 14 years and 1 day after my WAGS valve was installed we came home from a NE heatwave day trip, I hit the shower and ugh....no hot water flowing, my mind went 0-100 and I ran to the laundry/utilities/family room walkout. Not a drop of water had hit the recently installed plank flooring - what a relief! There sat the trusty old WAGS, wading in 1" of water in the 3" drip tray, no water dripping and the gas shut-off killed the pilot light - AWESOME! The thought of replacing the 400 s/f of flooring, repairing the wet drywall, baseboards, trim, paint, new couches, chairs, valuables - - whew! WAGS did its job and saved us $1000's in out-of-pocket repairs or a $5k homeowner insurance deductible. Well, I enjoyed every short-minute of my coldest water shower - then placed my order for a new WAGS.